Classic pub styles meet modern tastes. We wish everything in life called for Mommy’s Fabulous Finds’ creamy avocado lime sauce. 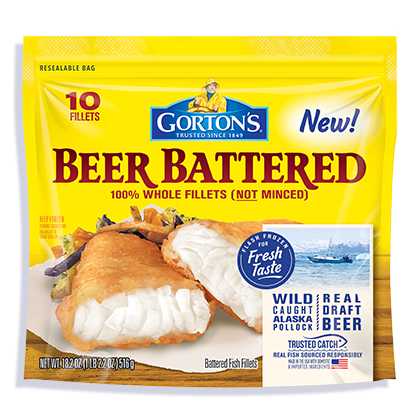 Bake the beer battered fish according to the directions. While the fish is baking, cut the cabbage into thin slices. Chop up the cilantro. Using a food processor or blender, combine the Greek Yogurt, avocado, lime juice, and cilantro. Blend until smooth. Warm the tortillas in the oven or microwave. 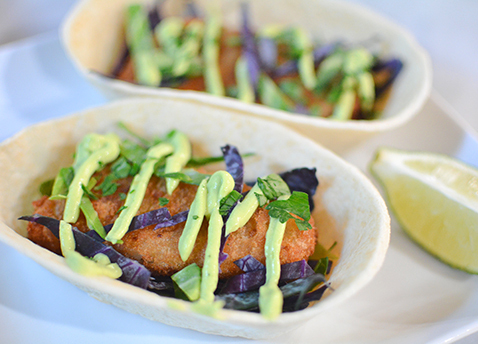 To assemble each taco, place the fish fillet inside the taco boat and top with cabbage and the creamy avocado lime sauce. Garnish with addition cilantro and serve with a lime wedge.